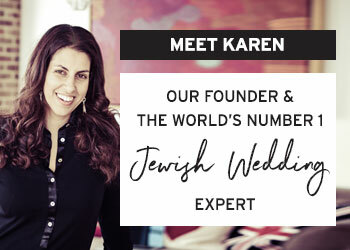 Today’s real Jew-ish wedding is a very special one for all of us here at STG – not just because it’s an absolute stunner, but because the bride, Lacey, is a much-loved, active and hugely supportive member of our Smashing The Glass Brides Club Facebook group. It’s an absolute pleasure to finally be able to celebrate her and Brandon’s fabulous wedding day – and if you haven’t joined Brides Club yet, what are you waiting for?! 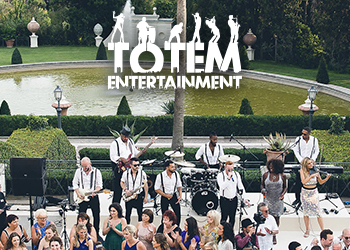 The fabulous event took place at La Caà±ada Flintridge Country Club, with spectacular views of downtown LA, and there were so many sweet and sentimental touches to the day. 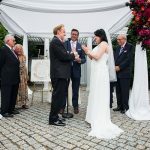 The simply beautiful chuppah was the couple’s ‘something borrowed’ item, with several friends getting married underneath it. Lacey and Brandon were married by the same judge who married her parents, in a Jew-ish ceremony that incorporated all the important elements. Style-savvy Lacey opted for a bold color scheme of navy blue with bright pops of orange, which looked absolutely wonderful and carried consistently throughout the floristry, decorations and wedding party outfits, along with a monogram motif, which we just LOVE. Lacey looked like an A-list dream in her gorgeous Melissa Sweet gown, which she bought at David’s Bridal, along with her veil and beautiful, navy blue bridesmaids’ dresses. The details and emotion of the day were captured by photographer, Jennifer Jasso Photography, tying everything together to perfection. 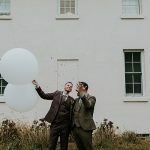 It’s now Lacey’s long-awaited moment to shine, after helping so many other of our brides with their big-day plans, so we’ll hand the blog over to her for the full writeup. Take it away, Lacey! 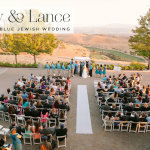 Lacey, the bride: We got married at La Caà±ada Flintridge Country Club (LCFCC) in La Caà±ade Flintridge, California, a suburb of Los Angeles. We wanted a venue that was close to where we and our families live. We also wanted a venue that would provide “one-stop shopping,” such as providing the tables, chairs, linens, etc. as well as the catering and beverages. Our ceremony was at the same place. We picked LCFCC because their pricing was very reasonable for the buffet options we wanted, they were willing to negotiate on some of the prices, and the club has amazing views from the ballroom. It is located in the foothills of the Angeles National Forest and, in addition to the wraparound patio with views all the way to Downtown Los Angeles, the ballroom featured floor-to-ceiling windows going all the way around. We knew the views would be spectacular for our guests and that we would not have to do a lot of decorating. The clubhouse is designed in a mid-century modern style that we both loved. Our wedding keywords were classic, timeless, and fun for all! We used those words when making all of our wedding decisions. We would ask ourselves, “Is this too trendy for our tastes, are we going along with a fad? Will we regret this decision in 30 years? Will this make our wedding fun for our guests?” We chose a bold combination of navy and orange as our wedding color scheme. We used a month-of coordinator, Tiffany. Her company, The Loved Co., does floral design as well as coordination, so she acted as both. Brandon and I picked all the items for our wedding, purchased, and organized everything. Tiffany took over the month of, and coordinated with all our vendors, as well as creating our day-of timeline and setting up all our dà©cor items. Everything looked perfect. Brandon initially didn’t want a day-of coordinator, he thought it was not a good use of our money. However, after how smoothly everything went, he now asks every engaged couple if they’ve booked a day-of coordinator; he’s a convert! We ordered our save-the-dates, RSVP and enclosure cards and invitations from Vista Print. They had lovely designs and were very reasonably priced. Our save-the-dates were postcards, to save on postage. Our invite design was clean, simple, and fresh looking. We both loved the monogram wreath design at the top, which we ended up using in much of our wedding day design. A family friend hand-wrote the addresses for us as a gift. Diana Campos of Brides by Diana did our hair and makeup with her assistant, Rae. I found Diana on Instagram just by clicking on various wedding-related hashtags. She was so personable and responsive. Her pricing was also reasonable with lots of a-la-carte options. After a lot of thought, I knew I wanted to wear my hair down, but off to the side so that the back of my dress was visible. My hair was curled, and then pulled to one side and secured. Rae placed the hair comb in my hairdo and Diana anchored the veil to my hair. I pinned a couple of makeup ideas, all in the realm of “soft” makeup. No harsh eyes or tons of bronzer or super dark lipstick. I wanted to stay light and summery. I loved my peachy-pink lipstick color. Diana and Rae also did hair and makeup for my bridesmaids and my mom. I loved how everyone’s looks came out. We all looked so beautiful, I felt like I was glowing and so glamorous. I was also very happy because my hair and makeup stayed put all day and into the night (which was great because I sobbed like a baby during our first look). I loved working with Diana so much, I already have her booked to do my hair and makeup for another event. I got my dress from David’s Bridal. It was the day after our engagement party, and I made two dress shop appointments so that my aunt, who was in from New Jersey, could come with me to try on dresses. She has three sons, so we do all the girly stuff together, and we had been discussing my wedding since I was a teenager. This was just supposed to be a try-on day. David’s Bridal was in my budget and the stylist I worked with got my style. Each dress she brought for me could have been “the one” honestly. My dress style was a little more modest, more conservative. I didn’t want slits or plunging necklines. I liked lace and floral appliques and an A-line dress shape. I love the dress I picked. The designer is Melissa Sweet. It came down to two Melissa Sweet dresses, but what really sold me on the dress I picked was that it had tank sleeves with a delicate button detail on one of the shoulders and a mesh illusion neckline. After talking to a few married friends, I decided that I didn’t want to be worried about anything inappropriate happening with a strapless dress. 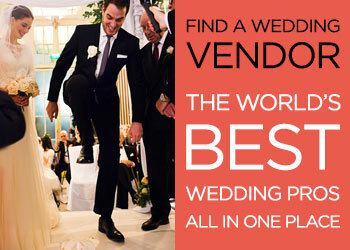 At David’s Bridal, once you pick your dress you ring a bell. After picking my dress, the stylist put the bell in my hands to ring and told me to make a wish for me and my future husband, and I started crying the happiest tears. I went back to David’s Bridal with my mom to pick a veil. My mom convinced me to try a chapel-length veil, and of course, mother knows best. I bought a gorgeous hair comb from a local Etsy vendor called The Veiled Beauty. Everything went together so beautifully, and my hair stylist did a great job anchoring the hair comb and veil in my hair. I never felt like anything was going to fall out. I love pearls, and I found an inexpensive pair of pearl-drop earrings from Amazon. In addition to my engagement ring and wedding band (both from Tiffany), I also wore a diamond and sapphire band that was an early wedding present from my fiance. The diamonds were from my grandmother’s wedding ring, and the sapphires were for our wedding month (September). We designed the ring with a jeweler in Downtown Los Angeles. I decided to wear silver heels. I already had a pair of pink high heel sandals that were comfortable, so when I saw the same model in silver with rhinestones on sale for $35 I snapped them up immediately. The heels are about 3″ high, which is the most comfortable height for me to wear long-term. I did not want to have to switch to a second pair for dancing (although I did have a pair of flats ready in my bag just in case). I was able to wear my heels all night with no trouble. I also bought them with every intention to re-wear them many times. We wanted to keep everything very simple, so Brandon and his groomsmen rented from Men’s Wearhouse. The guys rented dark grey tuxedos with brown shoes and Brandon’s dad rented a light grey suit to match the light grey suit that my dad decided to wear (he bought his own custom suit for our wedding). To make sure Brandon stood out, he wore his tux with a vest and he wore a different colored tie from the other guys. I think all the guys looked so marvelous. The tuxes fit them very well. I had three bridesmaids and one matron of honor. My matron of honor, and one of my bridesmaids, are friends from college. Another bridesmaid is a good friend of Brandon’s from college. Those three girls, coincidentally, went to high school together in northern California. We found this out pretty early in our relationship, and in my mind, it’s one of the reasons I knew Brandon and I were meant to be. My fourth bridesmaid was Brandon’s sister. I knew for a long time even before I was engaged that I wanted navy blue bridesmaid dresses. I just love the color. It is so classic. And it went with our color scheme. After trying on dresses with my matron of honor we both fell in love with one dress design, so I decided that all the girls would wear the same dress. I really love the dress I picked, I love the lace top, the cap sleeves, the pretty flowy skirt, and the ribbon at the waist. I also love that it was so flattering for all the girls. Since my bridesmaids didn’t live in the same area, I decided to get dresses from David’s Bridal, so that each girl could go to their local salon and try on the dress before purchasing. The girls wore silver shoes and I gifted them with earrings and bracelets to wear. There’s something so special about being married using the same chuppah as another loved family member. All we asked our florist to do was build a floral piece for the top of the chuppah. 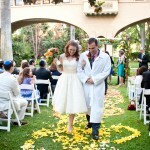 In the end, we didn’t stand so much under the chuppah as we did in front of the chuppah. Even before getting engaged, I knew that I wanted to be married by the judge who married my parents back in 1984. The symbolism was so important to me, to have that continuity. My parents (especially my dad) were just thrilled when I said I wanted Judge Hatter to be our officiant. Brandon was also on board with having a judge as our officiant (neither of us is religious) and he also liked the symbolism of having the same officiant as my parents. Judge Hatter’s office is actually really close to where we live. We met with the judge a few times before our wedding and gave him a general idea of what we wanted our ceremony to look like, short, sweet, to the point. We did not give him a specific script except for asking him to read our ketubah text. The judge also said that he thinks our wedding might be the first “second generation” wedding he’s performed! For our processional we knew we wanted both of our grandmothers to walk down the aisle. And I decided to be escorted by both of my parents. 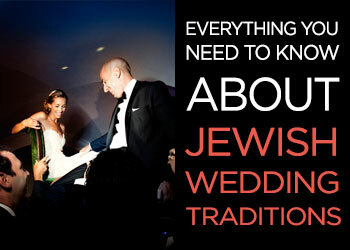 We did incorporate some important Jewish traditions in our wedding ceremony. I am Jewish, my husband is not. 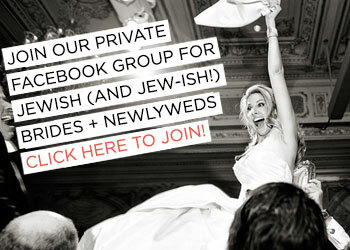 I knew that I wanted a chuppah for our ceremony and a secular ketubah that would be a keepsake in our home. We also loved the smashing of the glass. We used a light bulb as our smashing glass because it’s easy to break and makes a nice “pop” sound. My husband got it on the first try! We chose a beautiful ketubah with secular wording from Mickie Caspi (Caspi Cards). When I first told my husband about my desire to have a secular ketubah, he honestly thought I had made the word up. When I explained more and showed him some secular text options, he was right on board. I saw the ketubah of a high school friend of mine on her Instagram, and she told me she got hers from Mickie. I immediately fell in love with Mickie’s beautiful designs and her secular text. Our ketubah has a circular botanical design, and I love the quotes all around the text. The judge agreed to sign our ketubah as our officiant witness and two dear family friends also signed as witnesses. We chose to sign our ketubah before our ceremony in the presence of only our wedding party and immediate families. We were able to display our signed ketubah during our reception. The bridal party walked down the aisle to Nocturne in E-flat major by Chopin and I walked down the aisle to Doppio movimento from Appalachian Spring by Aaron Copland (also known as “Simple Gifts”). Our recessional music was Exit Music from the My Fair Lady movie soundtrack. For cocktail hour we asked for selections from the Great American Songbook, easy listening, some Bossa Nova. Artists like Sinatra, Dean Martin, Stan Getz, Astrud Gilberto. Our first dance was to The Way You Look Tonight by Sinatra. For the father-daughter dance, we picked Landslide by Fleetwood Mac and for the mother-son dance we picked You Are The Sunshine Of My Life by Stevie Wonder. For dancing, we had a selection of classic rock, pop, alternative, 80s music. We got the best compliments from guests on all of our music selections. We also really loved our DJ. The company we booked was recommended by our venue. We picked our DJ, Tetris, because he had a really great vibe and understood our music preferences. We wanted people dancing and enjoying themselves. We actually already have one friend who attempted to book DJ Tetris for his own upcoming wedding (he was already booked). Our coordinator Tiffany was also our florist. I love the floral work she did for our wedding. Everything just looked so beautiful. We decided to stick with mostly orange blooms. The only specific flower we asked to be included were roses, which are my favorite. Tiffany worked to put together a lovely palette of shades of orange with lots of greenery. 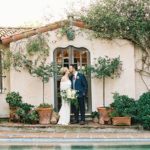 Tiffany took us to the wholesale flower mart in Downtown Los Angeles a few weeks before our wedding, so that we could see what was in season and give her a sense of what colors, textures, blooms, and greenery we liked. We told her to really use her best judgment, and boy, did she deliver. My husband requested artichokes in some of our centerpieces after seeing them at the flower mart. In my bouquet, there were dahlias, roses, blue thistle, eucalyptus. The bridesmaids’ bouquets were smaller versions of mine. I love how wild and natural the bouquets looked. The boutonnieres were very pale roses with orange and blue ornamental berries. All the bouquets and boutonnieres were tied with pretty pale-peach ribbon. For our chuppah piece and centerpieces, Tiffany used, roses, dahlias, marigolds, artichokes, blue thistle, eucalyptus, and artichokes. I especially loved the bright orange roses. For a little extra dà©cor, we also placed empty wine bottles with a single-stem rose around our cocktail hour location. Tiffany also placed the flowers on our cake. They were all gorgeous! All of our color choices tied to so well together. 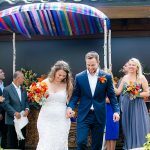 Our photographer, Jennifer Jasso Photography was recommended to us by our venue and we are so happy to have found her. We loved working with Jenn, because she was so much fun and made all of our bridal party feel so at ease. Her second shooter was also a great photographer. Together, they really got into the small details of our wedding. Our guests also loved them both. We have so many photos of our guests with just the biggest smiles on their faces. Jenn also shot our wonderful engagement photos that we used for our save-the-dates. I loved that Jenn was familiar with our venue having shot many weddings there before. I knew that she would understand how the rooms were set up, how to get the best lighting, where best spots were for portrait photos. Our venue provided a wonderful lookout point where you could look out onto the entire valley and all the way out to downtown. We got some wonderful sunset photos. Our wedding cake came from a very well-known local bakery called Porto’s. It’s a family-owned Cuban bakery with a few locations in southern California. After our tasting at Porto’s, we ended up choosing their traditional Cuban cake, a brandy-soaked sponge cake with a pineapple vanilla custard filling, and buttercream frosting. It was DELICIOUS! Seriously, I’m not a huge fan of cake, but this was simply divine. My husband was really apprehensive at our tasting because he is a die-hard chocolate cake fan, but as soon as he tried it, he loved it! The rest of our food was provided by the club and it was DELICIOUS! We had a buffet dinner and everyone complimented us on the excellent food. We had a photo booth. I really love photo booths at events because I think it’s just a fun way to get a little wacky and take some memorable photos. The photo booth was also provided by our DJ company as part of a package deal. We worked with the company to design a photo booth template that included our monogram. The photo booth also served as our favors. We included many personal details that really made our day special. The first was using the monogram from the top of our invites throughout our wedding dà©cor design. We embroidered it in blue on a piece of white fabric and sewn into my wedding dress, used it for the photo booth template, welcome signage, program, dinner menu, and the table runner underneath our cake. A second way we made the day personal was to include photos of our parents’ and grandparents’ weddings. Everyone loved that touch. My mom took it a step farther by dying her wedding dress a lovely shade of green and wearing it to our wedding (her wedding dress was not a traditional wedding dress). I just loved having my mom wearing the dress she wore to marry my dad. I also used a free printable found on Pinterest for table numbers and hung them on wine bottles. Most of the dà©cor items were purchased from inexpensive stores like Ikea, Etsy vendors to print at home, or were found for free on Pinterest. We also used a lot of coupons and even recycled items used at our engagement party. I was especially proud of the programs and menus, which I designed myself on Canva for free and printed using an online printing service. All of the speeches given were so heartfelt and really captured us as a couple. The best surprise was from Brandon’s dad. During his speech, he presented us with a framed congratulatory note signed by the Los Angeles Dodgers! Brandon’s family are huge Dodger fans. Our wedding day was the most special day of our lives. It’s a clichà© to say, but it was. The whole day went by so smoothly and I think a lot of that was because of the vendors we chose, any of whom I would recommend to any other couple in a heartbeat. We worked very hard behind the scenes to have everything organized for the big day, so that we could sit back and enjoy everything. Even so, the day still went by way too fast! And even two months later we are getting the nicest compliments from our guests on the food, the music, the venue. Everyone had a great time and that was the most important thing to us. It’s so easy to tell someone not to stress, but it’s almost impossible to actually NOT stress leading up to the wedding. Once we got to the two-week countdown I would just tell myself, what’s done is done. Your wedding will be beautiful, it will be special because you have put your heart into the planning and because at the end of the day you will be married. Also, don’t be shy about asking your vendors to negotiate on price, but don’t be offended if they say no (they are running a business after all). Love the photography! The bride is stunning, and the dress is just perfection!! This is so fun. Congratulations guys! !